These wonderfully crisp macaroons with their soft, chewy centres and choice of fruity fillings make ideal gifts for family and friends. Preheat the oven to 200ºC, gas mark 6. Line 3-4 baking trays with baking parchment. Place the egg whites in a clean, dry mixing bowl and add a pinch of salt. Whisk until stiff peaks form. Add a third of the icing sugar and whisk until the mixture is stiff again. Using a metal spoon, gently fold in the rest of the icing sugar, plus the almonds, until the mixture is smooth. Be careful not to over-mix. If you have a piping bag with a plain nozzle, use it to pipe the mixture onto the trays in 5cm rounds. Alternatively spoon the mixture onto the trays. Ideally, leave the rounds to dry out a little for about an hour before cooking. Place both trays in the oven and cook for 8-10 minutes, until just firm, swapping the trays over halfway through. Take out of the oven and cool for 5 minutes before removing from the paper. 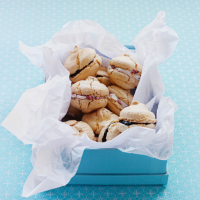 When completely cool and ready to serve, sandwich half of the macaroons together with a little of the conserve and the other half with a little mascarpone mixed with the chopped strawberries. Unfilled macaroons can be kept in an airtight container for 3-4 days. Fill with other types of soft fruit such as raspberries.